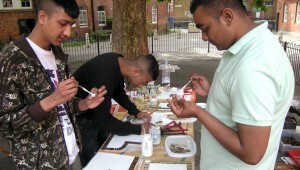 Art4space run workshops using, a wide variety of materials including recycled art, withy, clay or paint. Workshops can include community event days and making withy sculptures for festival and processions. We also offer community consultation packages with creative and effective ways to generate ideas from a community to input in a new park development or to feed into planning ideas. Art4Space also run after school workshops putting together exciting themed programmes for children to learn and express themselves creatively in relation to curriculum topics. We can tailor art workshops for youth club activities or projects involving older people. Charlotte at Romford boys school.